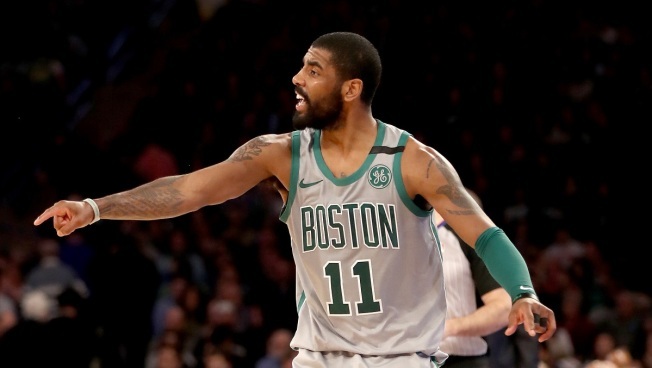 In this February 24, 2018, file photo, Kyrie Irving #11 of the Boston Celtics directs his teammates in the second half against the New York Knicks at Madison Square Garden in New York City. Kyrie Irving offered a simple message to science teachers Monday. The whole saga started in February 2017, when Irving questioned whether the Earth is flat on a podcast that came out shortly before All-Star weekend that year in New Orleans. It became a major story and even NBA Commissioner Adam Silver — who, like Irving, went to Duke — was asked to offer his opinion.